Fly privately to/from America’s second greatest casino city with our Atlantic City Jet Charter service. Atlantic City is located on the shores of New Jersey, and is home to world-class entertainment, luxurious resorts and exciting casinos. Despite its success over the years ebbing and flowing like the tides along its sandy shore, Atlantic City remains a popular destination for private flights along the east coast. Private jet travelers choosing to fly to Atlantic City using our air charter service will have over a dozen airports located within 50 miles to chose from. Chartering a private aircraft allows you to bypass the terminals and directly board your aircraft to save time, while increasing the number of airports your private flight can arrive at. Whether you prefer flying into (KACY) Atlantic City International, smaller airports such as (KMIV) Millville Municipal and (KOBE) Woodbine Municipal, or private aviation fields such as (17N) Cross Keys Airport, let our team at Atlantic City Jet Charter arrange the right aircraft for your private flight to/from Atlantic City, New Jersey. Atlantic City has a lot to offer private luxury jet travelers, from its iconic boardwalk, landmark casinos and world-class entertainment, to a variety of hotels and resorts for luxury getaways, business trips, weddings, bachelor/bachelorette parties and more. Many of the major casinos along the boardwalk offer luxury stays on site, most notably the five-star Water Club at Borgata, while non-casino options such as the luxury boutique hotel The Chelsea are available as well. There’s also the Claridge Hotel, once known as the “Skyscraper of the Sea” and host to celebrities such as Marilyn Monroe and Frank Sinatra. Once you arrive in New Jersey via luxury private jet, our Atlantic City Jet Charter service brokers can also arrange ground transportation to/from the hotel of your choice. Check out some of our jet charter client’s favorite hotel and casino resorts before your trip. Charter a private flight to Atlantic City, the seaside gaming resort on Absecon Island off the coast of New Jersey. The city is the premier gaming destination on the East Coast, drawing more than 25 million visitors a year. Like many a player at its tables, Atlantic City has seen its ups and downs over the years. The city originally popped up in the mid-19th century as a stop along the Camden and Atlantic Railroad. Hotels and resorts lined up along the shore as the route gained popularity, and the city became a popular playground for its beaches, attractions and entertainment – Frank Sinatra even once said “I feel at home” in the city during its peak in the 1950s. The city lost some of its luster through the following decades, but a referendum bringing legalized gambling to Atlantic City in 1976 returned it to glory as a tourist hotspot along the Atlantic coast – learn more about Atlantic City Casinos here. The following is a list of more recommendations for things to do after your private flight to Atlantic City, New Jersey. 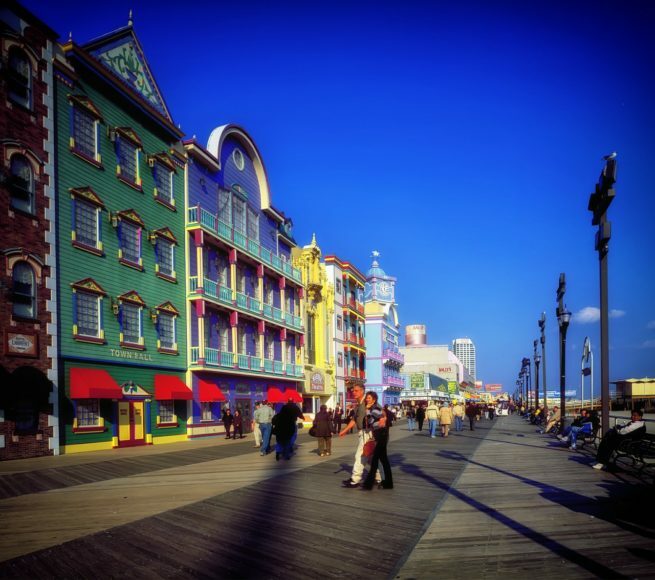 The main attraction in AC, you’ll find the best casinos on the east coast when visiting Atlantic City, New Jersey. From themed resorts such as the Taj Mahal and Caesar’s, to modern luxury gaming resorts like Bogata, there’s something here for everyone. Check out our page for more details about the Casinos in AC. 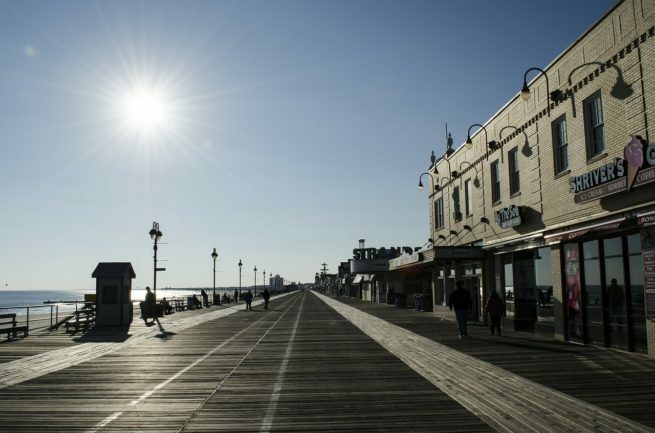 The 4-mile long iconic Atlantic City Boardwalk that runs along the Jersey Shore was originally built in 1870 to keep sand from getting in local resorts and trains. The first walkway of its kind in the world, the boardwalk quickly became a hotspot with shops, bars, restaurant and amusement parks lining the walkway, and popular piers branching out from the main path.